The retirement of the Shuttle fleet left a rather large hole in the Kennedy Space Center’s (KSC’s) ability to launch and conduct human orbital space operations. At the conclusion of the historic reusable spaceplane program, NASA vowed to transition KSC from a single-user, single rocket facility into a multi-user, multi rocket spaceport for the 21st century. The first two steps in that plan were the initiation of reconstruction efforts of pad 39B to prepare it for the ability to launch NASA’s Space Launch System rocket for Beyond Earth Orbit missions and the 2014 agreement for a 20-year lease of pad 39A to SpaceX for its Falcon 9 and Falcon Heavy rockets. 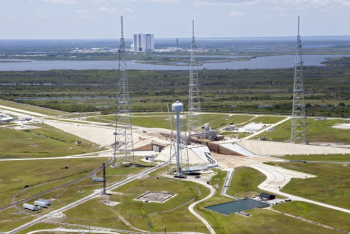 With the final Shuttle launch from pad 39A on 8 July 2011, the pad lay dormant as reconstructive efforts took place ahead of SpaceX missions. After Atlantis’ final launch from Pad A, the vehicle returned for the final landing of the Shuttle program back at the Kennedy Space Center on 21 July 2011 – after which the Shuttle Landing Facility (SLF) has not since hosted an End Of Mission (EOM) landing of an orbital mission. With Boeing building and processing its CST-100 capsule inside former OPF Bay 3 as part of NASA’s Commercial Crew Transportation services contract and the completion of platform installation in the VAB for SLS stacking operations, the Kennedy Space Center is truly shining as a multi-user spaceport. Specifically for the Air Force, the ability to use the SLF at Kennedy marks what is hoped to be the first of many uses of the SLF as the primary EOM landing facility for the X-37B – which the Air Force hopes to launch, land, and refurbish at KSC and the Cape Canaveral Air Force Station. 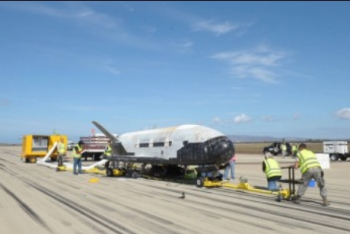 In fact, after landing, the X-37B is expected to be towed to OPF-1 for post-flight servicing operations. This operation has been tested several times with a mock-up space plane. The fourth flight of the Air Force’s experimental X-37B spacecraft had already clocked over 700 days in space, with this morning’s landing bringing the total mission duration to 717 days in space. Opportunities to land the fourth X-37B mission came as early as February, with NOTAMs, orbital adjustments, and teams at KSC all primed. These earlier attempts for the X-37B to approach the Kennedy Space Center, with the Range holding a space for several return opportunities, took the form of practice runs before weather became a major factor for what turned out to be a false landing attempt. Based on the specific path the X-37B followed in its entry sequence this morning – understood to be a descending node entry over portions of the United States and Florida – large swathes of Central Florida were always going to be the first to be graced by the news of her return, via sonic booms as the X-37B rather insistently heralded its arrival back home. Twitter posts pre-empted this return, later confirmed by the Air Force. The ability for this fourth mission to attempt a return to the runway at Kennedy followed three highly successful, completely autonomous deorbit, entry, and landing sequences of the first three X-37B flights, which all ended with precise touchdowns at the runway at Vandenberg Air Force Base, CA. OTV-2 and OTV-3 landed without incident following a blown tire that led to minor underbelly damage of the OTV-1 vehicle (which subsequently flew the OTV-3 mission). The expected mission duration for this fourth flight had been 637 days, but in the end, its 717 day mission duration beat OTV-3’s flight which lasted 674 days and 22 hours. Previously, the first two OTV missions of the X-37B each extended the orbital mission duration of the previous flights, with OTV-2 being in space for 468 days and 14 hours over the OTV-1’s 224 days and 9 hours. 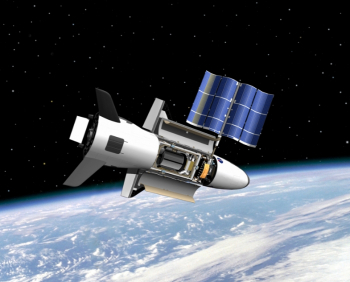 Moreover, the prolonged duration of the third and fourth X-37B missions highlight the secretive nature of the spaceplane, its missions, and its designed orbital lifetime – which is currently listed as 270 days… something which three of the four missions to date have shattered. Presently, two X-37Bs are known to exist, with the first flying the OTV-1 and -3 missions and the second flying the OTV-2 and -4 missions. 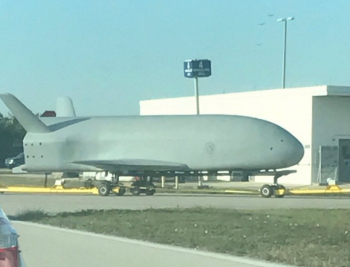 In all, each X-37B is 8.92 m (29 feet 3 inches) in length, has a 4.55 m (14 foot 11 inch) wingspan, has a height of 2.9 m (9 feet 6 inches), and has a maximum lift off weight of 4,990 kg (11,000 lbs). The vehicles are powered by gallium arsenide solar cells with Lithium-ion batteries and contain a 2.1 x 1.2 meters (7 feet x 4 feet) payload bay. In preparation for landing at Kennedy, teams practiced landing drills and post-landing safing operations as well as emergency drills at the SLF, even using a mock up during tow tests. With spacecraft observers noting a February change to the orbit, that – at the time – appeared to point to a landing attempt, along with activity at the SLF and NOTAM posts, the Pentagon deflected the interest in the potential landing, citing that the program was conducting a “regularly scheduled exercise” in a quote provided to Florida Today. Interestingly, the actual landing on Sunday – three months later – had little by way of a heads up per the above observations.